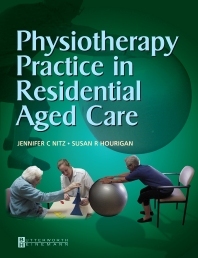 With the numbers of entrants to residential aged care facilities steadily growing, there is a need for a clearly written, portable guide to the wide range of knowledge and treatment skills unique to the physical therapist in this challenging setting. This new resource looks at the physiological changes accompanying the aging process as well as the physical therapist's role in assessment, preventing residents' injuries, and promoting quality of life. Major presenting problems relating to being immobile, barely mobile, or ambulatory are examined. Information and strategies to assist with residents suffering from pain, osteoporosis, incontinence, or disorders requiring palliation are also covered. In addition, there is a special chapter on aquatic physical therapy in response to the increasing use of pools in aged care facilities. This new book is an outstanding reference for practicing physical therapists, students, and those who care for older adults in their own homes. 7. What about beds and chairs?